← How to print MS Office Excel to png? Excel is not that kind of file, like PDF which can be set a password against free printing and changing or others. We need to take this weakness into consideration during the uploading. It will be a totally different situation if we convert the Excel to image, such as Excel to bitmap, then we can upload the content of an Excel freely. Take converting Excel to bitmap for example to show you how to make the conversion from an Excel to image file. 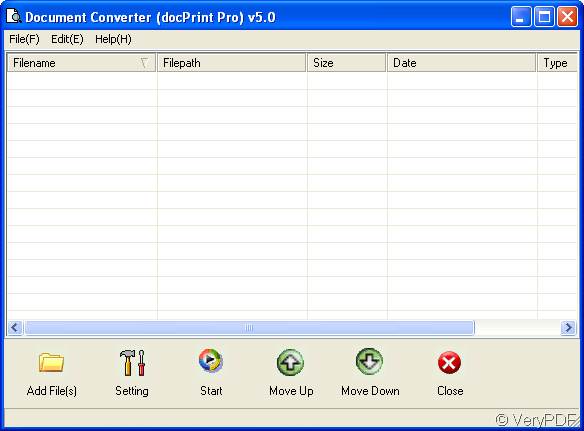 I do the conversion with the help of docPrint Pro which is a professional printing driver and file format converter. It not only can convert Excel to image file bit also can convert nearly all the printable file to image file format, such as PDF to bitmap, word to PDF and so on so forth. If you feel the functions cater to your need, there is the free trial version available. This is the link for you. http://www.verypdf.com/artprint/index.html It only has 4.00 KB, you can download it in a minute. If you download it successfully, the icon of this software will be shown on the desktop. Double click its icon, you can use it work for you. 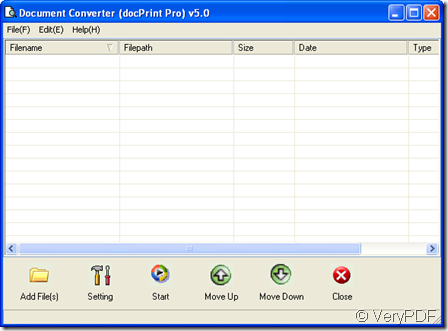 Detail operation of docPrint Pro. Add file or files to it. Beginning from its user interface to talk about the usage, there are many blanks above the menu. The blanks part could be dragged to endless long then you can add the converted file as many as you need. Simply drag the files from its folder to the blanks will be OK. Then the details of the file, such as file path, adding date, size will be shown on it too. You can also add the file by clicking the button add file to add them. The conversion has been finished half up to now. Now you need to set the target file format and limitations for the bitmap file. As we need to convert Excel to image-- Excel to bitmap, we have to choose bitmap as target file format. Then if you need to adjust the color depth and color resolution, please go to save image sub menu label. Click the button OK to back the main interface. Click the button start to choose a folder to save the converted bitmap file, then conversion will process automatically. It last maybe 3 seconds then you can find the converted bitmap file in the chosen folder. If you would like the use the command line version of docPrint Pro, it is also available on its website. Under the help of docPrint Pro, converting Excel to image is as easy as reading ABC. This entry was posted in docPrint Pro and tagged docPrint Pro, excel to bitmap, Excel to image. Bookmark the permalink.